Pádraig P. Harrington (born 31 August 1971) is an Irish professional golfer who plays on the European Tour and the PGA Tour. He has won three major championships: The Open Championship in 2007 and 2008 and the PGA Championship, also in 2008. He has spent over 300 weeks in the top-10 of the Official World Golf Ranking, and reached a career-high ranking of third in July 2008. He grew up in Rathfarnham, an area Dublin's Southside and the birthplace of two other touring professional golfers – Paul McGinley and Peter Lawrie. Harrington attended local secondary school Coláiste Éanna at the same time, but not in the same year/class, as McGinley, giving it the unique distinction of having produced two Ryder Cup golfers. Encouraged by his brothers and father, Harrington's interest and passion for the game grew as he developed his game at the nearby Stackstown G.C. After a successful amateur career, including winning the Walker Cup with the Great Britain & Ireland team in his third appearance in 1995,Harrington turned professional later that year, joining the European Tour in 1996. Harrington came to professional golf at a relatively late age, having studied accountancy at university for a number of years while playing high-standard amateur golf. He was unsure whether to turn professional, initially doubting his skills. Harrington won a further two events on the European tour in 2004 at the Omega Hong Kong Open in December 2003 and the Linde German Masters in September 2004. Harrington finished the season 3rd on the European Tour's Order of Merit, this was the 4th consecutive year in which he was within the year end top-5 and the 6th consecutive year in the top-10.Harrington once again qualified for the 2004 Ryder Cup, hosted at Oakland Hills Country Club where he was part of a European team that defeated the United States by the largest winning margin by a European team in the history of the event. 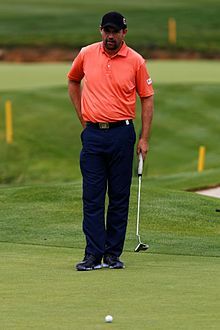 Harrington has spent a considerable amount of time both in the top ten of the Official World Golf Ranking (over 300 weeks between 2001 and 2010) and achieved his best ranking of third following his second Open Championship victory. He has also played for Europe in six Ryder Cups; losing in 1999 and 2008, but winning in 2002, 2004, 2006 and 2010. He has also won the par-3 contest at Augusta National, held the day before The Masters, in 2003 (tie), 2004 and 2012 (tie). Harrington is a distant cousin of 1995 World Series of Poker champion and author Dan Harrington and former NFL quarterback Joey Harrington.